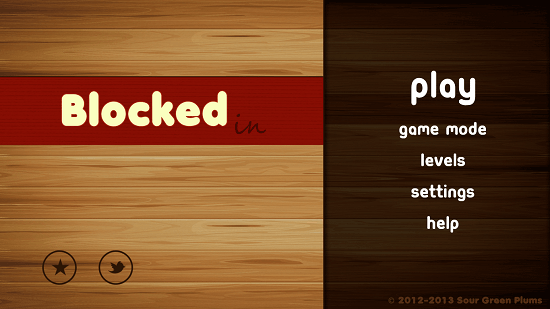 Blocked In is a free puzzle game for your Windows 8 and 8.1 desktop. The game is impressive from the startup page itself. This puzzle game has been developed by Sour Green Plums, it has beautifully designed interface. The game menu options are rightly aligned. The color scheme of the game has been kept subtle and appealing. The main menu comprises of play, game mode, levels, settings and help. The game mode comprises of challenge mode and relax mode; in challenge mode you are rewarded with stars for completing the level with minimum moves and in relax mode, you can play the puzzle without worrying about the moves and you will not be rewarded for it. 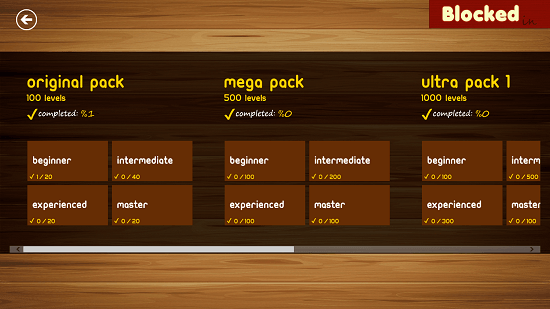 Levels are divided into different packs namely, original pack, mega pack, ultra pack 1, ultra pack 2 and ultra pack 3. All these packs can be completed by earning the stars mentioned under every sub-category of the packs. Settings menu includes various basic settings like music, volume, notifications, etc. Help menu is for showing you how to play the game. The game is based on moving the brown blocks from the path of the red block on left side and sending it to the pathway on right side to reach the next level successfully. The difficulty level keeps increasing as you keep completing different levels of the game. You can also try out puzzle game apps like crack attack and super jelly for Windows 8. The blocks in the level can be moved with the help of your desktop’s mouse. Click and hold the block which you want to move and drag the block to the place where you want it to be. If you are not satisfied with your game play, you can play the level again at the end of completing it or alternatively you can click on double arrow on the game’s top right area to reset the moves you have played and start from the beginning. The game is addictive and useful too as it can help you increase game solving skills.